Freeway Studies #2: Inside the Quad featured the work of 31 contemporary artists whose studios were located within the borders of the I-405, 110, 10, and 105 freeways in Los Angeles. Freeway Studies #2: Inside the Quad featured the work of 31 contemporary artists whose studios were located within the borders of the I-405, 110, 10, and 105 freeways in Los Angeles. Over a six-month period the curators visited nearly 100 artists working (and often living) in the designated area and documented each visit for the project blog, which also includes documentation of the studio visits conducted in preparation for Freeway Studies #1: This Side of the 405 produced in 2013. Freeway Studies was a multi-year, contemporary art-focused curatorial project organized by Meg Linton, Director of Galleries and Exhibitions, with the assistance of Jeseca Dawson, 2012-2014 Curatorial Fellow, at the Ben Maltz Gallery at Otis College of Art and Design. Freeway Studies is a multi-year, contemporary art-focused curatorial project organized by Meg Linton, Director of Galleries and Exhibitions, with the assistance of Jeseca Dawson, 2012-2014 Curatorial Fellow, at the Ben Maltz Gallery at Otis College of Art and Design. 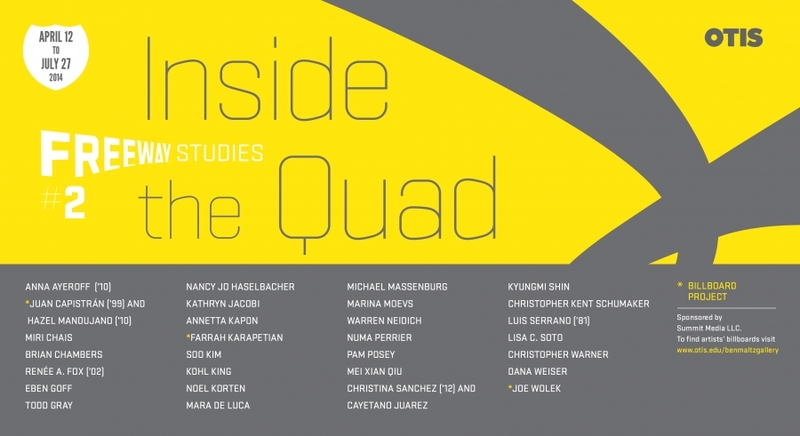 Freeway Studies #2: Inside the Quad features the work of 31 contemporary artists whose studios are located within the borders of the I-405, 110, 10, and 105 freeways in Los Angeles. Over a six-month period Meg Linton and Jeseca Dawson visited nearly 100 artists working (and often living) in the designated area and each visit is documented on the project blog.